The weekend of June 1st, I went with my parents to Chicago for a Star Trek convention, where we got to hang out with my “bonus sister” Talia, and helped René raise almost $3,000 for Doctors Without Borders in his autograph line. This is always a very satisfying activity, because René does all the work of signing, Talia does most of the work of explaining to the people in line what we’re doing, and I just get to stand there, answer questions, and accept money from cheerful, generous people. It felt a little weird to be at a convention that was entirely devoted to Trek, since my favorite annual con here in the Twin Cities, CONvergence, is pretty much founded on the idea of being about EVERYTHING all at once. So in Chicago I always had this feeling of, “yes, but where’s everything else?” But it was fun, as usual. While we were helping with the autograph line we got to chat with people from literally all over the world, including Australia and England and Russia and all over the United States. One of the big draws at this particular con was that most of the cast of Next Generation was there, including Patrick Stewart. We ended up near a bunch of them together in the hotel restaurant at one point and it was a bit overwhelming. 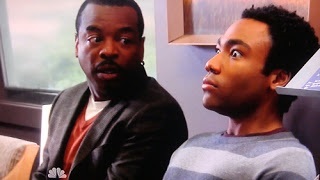 My boyfriend and I had just recently watched the episode of Community where LeVar Burton guest starred, so I kind of felt like Troy, freaked into paralysis by encountering LeVar in person (or, in my case, LeVar, Jonathan, Brent, Marina, Gates, Michael, and Sir Patrick). We didn’t actually go to any of the official convention panels except for part of one with René and Ethan Phillips, and that was mostly so Talia could get the audience to sing “Happy Birthday” (the Saturday of the convention was his actual 73rd birthday). It’s not that I don’t care about hearing the guests speak–I certainly still feel interested in hearing what they have to say. For example, seeing Zachary Quinto and Leonard Nimoy on stage together in 2008 was the first thing that made me excited to see the new Star Trek movie. But a lot of times I do feel like I’ve heard or read most of the information before, and you can only get to know someone so well through hotel ballroom Q&As. In addition, the Creation conventions have a pretty corporate feel to them, in my opinion. They charge attendees not just for admission, but for anything they can think to itemize, from autographs to photo opportunities to front-row seats at panels…. (Does this make them the convention equivalent of Spirit airlines?) I think this makes interacting with the performers seem all that much more like a transaction, which again is in contrast to how a small fan-run convention like CONvergence can function, allowing guests to more or less participate in the proceedings as attendees (very special attendees, no doubt, but still). Author Paul Cornell wrote a lovely blog post the wonders of CONvergence from when he first attended in 2010, and I think he hits a lot of the key points. He was back again last year, when (among other things) he conducted an outdoor interactive panel Teaching Americans to Play Cricket (if you’d like to read more about that, I’ve got another blog post for you. I hadn’t intended this to turn into an essay about CONvergence, but the Chicago convention did get me thinking a bit about fandom and fan communities and how fans interact with celebrities…we had a bit of a debate among our group about the extent to which the convention is sort of a socially sanctioned form of creepy behavior that would, in other contexts, be stalking. I think there’s another blog post in here somewhere, about the (real and/or illusory) intimacy afforded by social media, but this has gotten way long already so I’m going to call it quits. Perhaps ORACLE can provide a venue for some discussion/debate about the evolution of fan behavior. Do we think it has changed in any substantial way now that we can follow artists we admire on Twitter? To what extent does social media access help fans understand and respect performers better as people, versus leading us to feel overly entitled when we meet them in person? (If you haven’t already read Wil Wheaton’s very interesting piece that is sort of related to this question, check it out.) Discuss! As Miriam mentioned, my family and I attended only one day of Creation’s three-day convention in Chicago. We planned to help out at René’s autograph table, where he likes to raise money for charity (usually Doctors Without Borders) and we looked forward to seeing him share the stage for a silly comedy routine and brief Q&A with his friend Ethan Phillips. We had heard that Nana was scheduled to make her appearance at the convention on Friday, and so we didn’t expect to have a chance to see her at all. 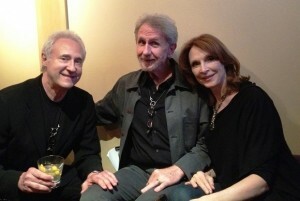 In addition to the opportunity for fans to see René, Nana, Ethan, and several other actors from different Trek series, one of the main events of the weekend was the announced appearance on stage on Saturday night of most of the cast from The Next Generation, including Sir Patrick Stewart, Jonathan Frakes, Brent Spiner, and Gates McFadden. This turned out to be a good thing for Creation–a huge number of fans turned out for the convention–but not quite as good for many fans, because tickets for Saturday completely sold out several months before the event. I talked with several of René’s long-time fans who had intended to come see him but weren’t able to get a ticket because of the unusual sell-out. Another consequence of the presence of so many of the “big name” Next Gen cast members was that arrangements for all of the actors’ autograph sessions were more complicated than usual. However, I think this worked out to René’s advantage. Instead of signing for a marathon two or three hours after his onstage Q&A session, René was given three autograph session times, from 9:00 to 10:00 a.m., 11:00 a.m. to 1:00 p.m., and finally 5:15 to 6:15 p.m. Spreading out the autograph sessions meant that René didn’t have much free time during the day, but it also meant that each session was much less hectic, and therefore more pleasant for both the fans and René. 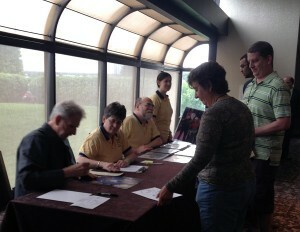 René’s autograph table was part of a long row of tables for actors’ signings set up in one of the hotel corridors near the main ballroom, across from a row of dealer’s tables. The area was well-lit and got a lot of traffic from fans entering the building through a nearby door and wandering by between main-stage events to check out the dealers and see which actors were currently available for autographs. René had a steady stream of fans coming up to say “hello” and get autographs, and our team of “Odo’s Minions” kept busy telling people about Doctors Without Borders and how a donation on their part would get them a personalized photo or “Odo’s Bucket” cartoon drawn by René. I sat directly to René’s left, keeping track of the people who came through with autograph tickets purchased through Creation. At one point, as René finished signing one fan’s autograph and looked down at the table for the next item he was going to sign, someone swooped down on him from his right and engulfed him in an enthusiastic hug. René, quite startled, sat back in his chair and said, “Who IS this?” and I turned to look, but all I could see was a slender, feminine arm; her face was pressed against the right side of René’s face and therefore out of my line of sight. However, I was able to catch a bit of her murmured reply and recognized her voice an instant before she released René and pulled back: it was Nana! Naturally René was delighted to see her, and she was highly amused that he hadn’t recognized her hug right away. He explained that all he could see when she hugged him was the edge of her tunic…which happened to be very close in color to an Original Series science officer blue! He, too, had known that she was supposed to be at the convention on Friday and therefore hadn’t expected that she might still be around, so the sight of what he thought was a Trek uniform made him automatically think “fan”. It turned out that she was scheduled to sign autographs for a couple of hours, so she settled down with an assistant at the table to our right, and she and René were able to chat a bit during a few quiet moments over the next hour or so. All in all, we enjoyed our brief time at this convention, and the Chicago fans were wonderfully generous: René raised close to $3,000 with his charity autographs! Also, at the end of the day, as René was getting ready to go to dinner, a big group of the Next Generation actors came through the lounge area of the restaurant, with Jonathan Frakes leading a chorus of “Happy Birthday” (more tuneful, it’s true, than the ballroom full of fans had produced…) the moment he spotted René. I suspect René might not want to spend his birthday every year working at a convention…but this year, at least, it all turned out well. Photos by (top to bottom): 1, online source; 2, 3, and 4, Talia Myres; side bar, Inna Ruslanova.